Cubilete is an old and very traditional game in Cuba that is second in popularity only to Cuban dominoes. Everyone plays it — from young school children to old grandmothers. Similar cubilete games are played in other Latin American countries, but the rules vary all over the map, with many cultures playing a version that is very much like the card game Poker. The Cuban game however is unique. Each player rolls one cubilete. The player with the highest cubilete (A-K-Q-J-G-N in order of value) goes first. Players take turns shaking the Cubilete cup and rolling out the dice. Each turn consists of as many as three rolls of the dice. After each roll, the player has an opportunity to take dice out of the cup and put them aside for his hand. Players can stop rolling any time after the first roll, if they are satisfied with their hand. Patas (points) are scored and a running total kept for each player. Once a player’s turn ends, the turn passes to the player on the left. 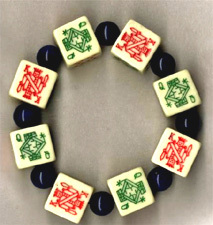 The object of the game is to roll five dice of the same kind. A hand with less than five of a kind has absolutely no value. To win a round, you need to get the highest hand. The winner of each round (and only the winner) wins points based on the value of their hand. A game is played to a total score of 10 patas (points). Whoever gets 10 points first wins the game, even if all of the players have not had a turn. The ultimate goal of the game is to score “Carabinas.” If you roll any Carabina during the game you immediately win the round and get to keep rolling for another round. There are three types of Carabina, listed in order of value. Carabina de Aces – is worth ten points and is very difficult to obtain. To get Carabina de Aces, you need to get a complete set of five aces within the three-roll limit. If you get Carabina de Aces, you are awarded 10 points. The game is over. You have eliminated everyone else in the game. You are the winner of the game, even if no one else had a chance to roll. If you get Carabina de Aces, then you are always the first roller in the next game. Carabina de Ks (Kings) Naturales – you need to have five Kings within your three allotted rolls. If you get this type of Carabina, you get five points. You win the round, the round ends and you keep on rolling on to the next round. Carabina de Ks (Kings) No Naturales – the only way to obtain this is by pairing the Aces with the Kings. (The Ace can be paired with any of the other dice because it is wild.) If you obtain this type of carabina, you get two points. You win the round, the round ends and you keep on rolling on to the next round. If they do decide to keep the Jacks for example, they would set the two Jack dice and the ace aside and re-roll the remaining dice. On their next roll, Player One gets one Queen and a Jack. Again, they would set the Jack aside and re-roll the Queen. Now the final roll. If they are lucky, they get either an Ace or a Jack, and end up with five Jacks. The turn passes to the player on the left. Player Two now knows that he or she must beat five Jacks to win the game. So this person obviously won’t try to roll for anything less than five Jacks. Once the dice cup has gone around the table, and no Carabina has been scored, the player with the highest hand gets one point. The player that rolls last is the first player to roll in the new round. The strategy in Cubilete is knowing what to play for and when, depending on what your opponents score. Obviously, luck is the dominant factor. Cubilete is often played as a drinking game, with several scoring variations. However, in all variations, losers tend to pay for the winners drinks!